Before the Punisher was born in Vietnam, Frank Castle had already become a dark legend of the battlefield. Stories about him were told in whispers, if at all. Now the legendary creative team of Garth Ennis and Goran Parlov brings the first of those stories to light: the tale of Frank Castle’s first command, and his first kill. During the Tet Offensive, death surrounded Lt. Castle’s platoon on all sides. How far would Frank go to protect his men? Especially when the danger came from the indifference of his commanders? And while Castle was engaged in the grind of war, a kindred spirit on the enemy’s side watched… and waited. It’s a seemingly hopeless mission. It’s Lt. Castle’s first platoon. It’s the answer to the question: What made the Punisher? 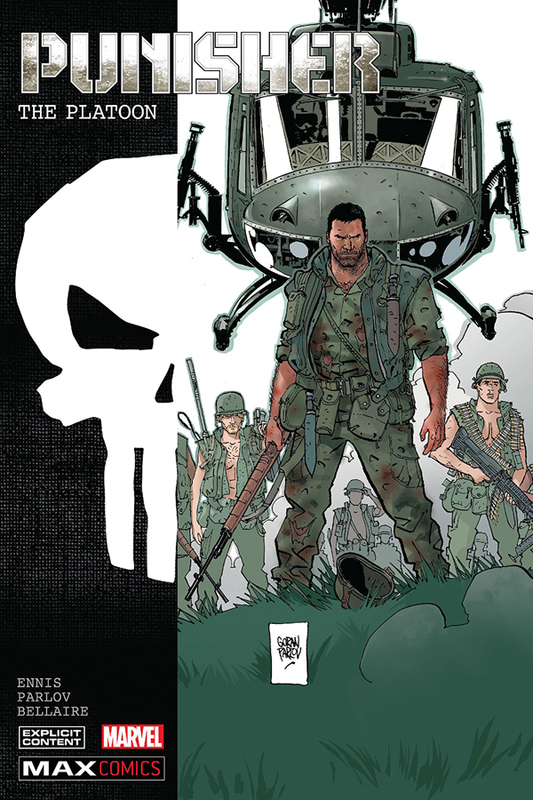 Collects Punisher: The Platoon #1-6.